Six races were held in the Challenger Playoff Semifinal today on Great Sound in 12-14 knots from the south. With yesterday’s races lost to winds in the 30 knot range, Race organizers were keen to try to catch up on the schedule today. In the first match, ETNZ had a problem with their port dagger board in the final approach to start and BAR had a 20 second lead off the line. The Kiwi’s looked a bit unstable through the first three legs but gradually got things under control and their speed started to show. Maybe they were having some lingering effects from the capsize and subsequent soaking of their instruments on Tuesday. On leg 5 however, the Kiwi’s closed and eventually passed BAR and went on to win. When able to control their boat, their speed was noticeably superior. This put ETNZ in a four – one advantage in this semi-final. In match two, Japan had Artemis in a bad spot but pulled the trigger a bit too soon and was over the starting line early and had to drop back behind Artemis. 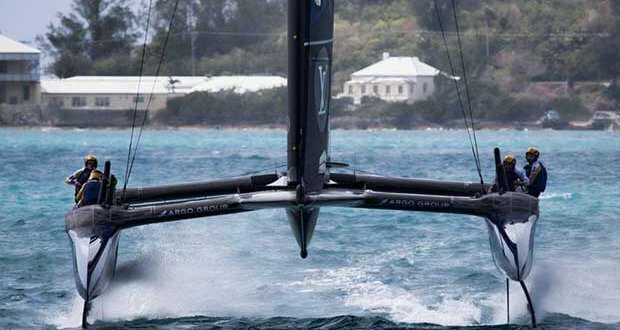 Artemis used old school match race tactics to keep tight control over the evenly match Japanese team and went on to win, brining that series to three – two in favor of the Japanese. In match three, a must win for BAR, they got the leeward side at the start and just hung on to the lead around Mark 1 and down the first run. Both boats rounded the same gate at the bottom and BAR kept a tight grip on the kiwis initially. About a third of the way up leg three, the Kiwi’s tacked off and BAR continued toward more pressure and extended their lead 50 meters. They knew they would need every meter to hold off the faster boat from New Zealand. 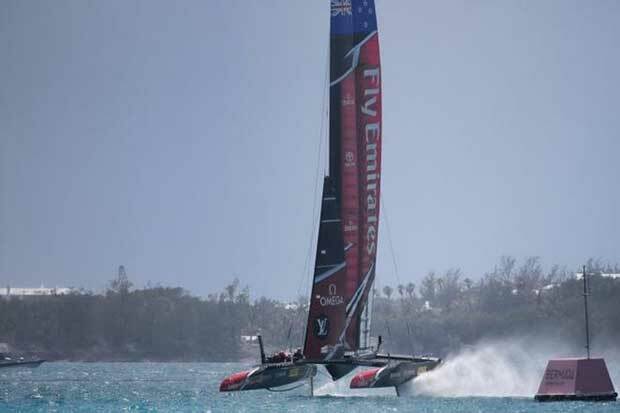 Sailing the perfect race, BAR held off the Kiwi’s to take the win and bring the score to four – two in favor of New Zealand. In match four, Japan, pushing Artemis, got too low on the lay line into the left hand mark and started 10 seconds late. Good recognition, by Outteridge, of the time and lay line situation so he knew when to give up fighting for the left and gauge up off Softbank. The Japanese looked less than smooth on the first upwind, making some bad tacks while Artemis, once again employing classic match race tactics, gradually stretched away to take the win. The score in that series now three – three. In match five, BAR was late for the start, game over as the Kiwi’s had the faster boat. That brought the BAR challenge to a close. It is easy to see that these teams are still evolving their technique and equipment. The Brits definitely sailed their last race today. In match six, Japan had the coveted left position off the line and barely held the inside at mark one and down to the leeward gate. Artemis systematically gybe early heading to the gate to set up the split at the bottom, something Softbank never did when trailing. At first cross on leg three, Softbank were 100 meters ahead. The Japanese maintained this lead around the next lap but upwind on leg five, Artemis were closing. As the boats were getting critically close, with Artemis coming back on starboard tack, the Japanese tacked in a spot where they had to bear away to miss the pink Vineyard Vines, Mark 1 which is a three meter diameter mark. This ultimately cost the Japanese the lead and the race. At the final top mark, Artemis was coming on port tack and Japan on Starboard tack. Artemis had buoy room, which is the room needed to round a mark while sailing her proper course. The Japanese were three boat lengths wide of the mark leaving Artemis plenty of room in my opinion. Artemis approached the mark very tight and did not tack within the three boat lengths of room that Japan had left them. In my opinion, a proper course rounding would have been set up and executed differently. But clearly Artemis were trying to initiate a rules confrontation and not necessarily interested in rounding the mark while sailing a proper course. The Swedes protested and the jury sided with them. I am not sure how the umpire debrief went but I think there may have been some memory there for the bad call, made at Artemis’ expense, a week ago. But that too is part of sport. That is why the coaches are constantly complaining to the refs in basketball. So ETNZ are through to the Challenger Playoff final which start Saturday. Softbank and Artemis have to race tomorrow decide the winner of their semifinal. Two races are scheduled; one win is needed for the Swedes to move on and two wins are needed for the Japanese.